As our cities become more crowded with an ever-increasing population the demand for accessible food products rises. Some innovative solutions have been proposed over time to alleviate the situation. We’ve seen an increase in rooftop gardens and growing solutions to take advantage of smaller spaces. There are now niche communities devoted to this. You just need to take a look also at some of the popular gardening and design books devoted to this movement in our major bookstores. California’s Aprilli Design Studio has come up with a vertical urban farm design, Urban Skyfarm to be built in Seoul, South Korea, to provide a unique looking growing solution for that crowded city. This prototype vertical farm project is designed to look like a tree and features a root area at its base for stability, a trunk section reaching into the sky supporting eight vertical branches with each supporting between 60-70 farming decks which from a distance look like the leaves on the ‘tree’. The designers claim the Urban Skyfarm would support local food production whilst at the same time contributing to improving the environmental quality through water, air filtration and renewable energy production. With the gardening based on hydroponic production, the design lifts the vegetation exposure upwards to the natural sunlight and fresh air, whilst the structure also provides shaded open space areas on the ground for pedestrians. Enclosed areas provide indoor growing environments with artificial lighting for more sensitive plant types. In all, the Urban Skyfarm provides 44,000 sqm of outdoor farming space and 28,000 sqm of indoor, plus a 3,200sqm solar panel area for renewable energy production. Water recycling has also been built into the design of the Urban Skyfarm, which is a net zero energy use facility. 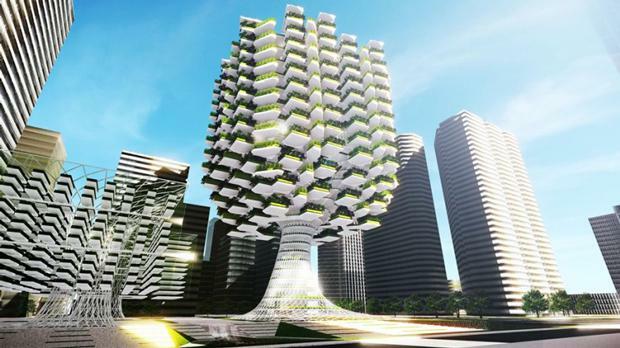 ALSO SEE: Is Vertical Farming A Solution For Dense Cities? Just as interesting is the Hive-Inn City Farm, which is a modular structure made out of shipping containers. The containers are designed and used as farming modules acting as an ecosystem where each unit plays a role in producing food, harvesting energy and recycling waste and water. New York City has been identified as the location for the first Hive-Inn City Farm once partners and investors are identified. Similarly it is anticipated to become a community focal point for nearby residents with containers being owned or rented by individuals, restaurants and major organic brands.